Just 18 months after Bulgaria became a member of the European Union, it risks losing millions worth of EU funds unless it can prove it is cracking down on corruption and organised crime. Some of the reasons for Bulgaria's plight can be found in the capital Sofia's leafy central cemetery. It is a who's who of those who became mega-rich during the country's murky transition to democracy and died in a hail of bullets. There have been 150 contract killings since 1990, but not a single conviction. The latest took place in April, not far from one of the busiest bus stops in Sofia. Best-selling author Georgi Stoev was shot three times, once in the head, and died later that day in hospital. A former wrestler, Mr Stoev had written nine books about Bulgaria's mafia bosses, many of whom he claimed to know personally. Some say he was killed by his characters. But his editor Vlado Daverov holds little hope of solving the whodunit. "It would be a first in Bulgaria," he said. Many suspect that crimes remain unpunished due to links between the former communist security services, business and politics. The interior ministry was recently rocked by revelations that senior officials had been leaking files to mafia suspects. 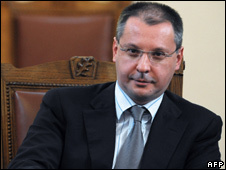 The interior minister himself had to resign after admitting he had met two controversial businessmen, Plamen Galev and Angel Hristov, who were under investigation at the time. The speculation in the local media is that the minister asked them to stop shooting members of a rival clan in the run-up to Bulgaria's EU accession. I drove to Dupnitsa, a town not far from the capital, to hear their side of the story. As former members of the anti-terrorist unit, Mr Galev and Mr Hristov look more like boxers than your average businessmen. But they drive to work in a black armoured jeep, which cost $400,000, and their office is in Dupnitsa city hall. As special advisors to the local mayor, they insist their reputation is unassailable. "If we were guilty in the slightest," Mr Galev told me, "do you think we'd be sitting here talking to you? "The authorities have checked our properties, the source of our income, they've checked us for drugs. The only thing they didn't accuse us of is being cousins to Bin Laden!" As for the meeting with the former interior minister, it was for reasons of national security which they could not disclose. They even drove me around Dupnitsa in the armoured jeep on a tour of their projects - leisure facilities in the local park, a new school canteen, a revamped bus terminal. "The politicians," they said, "should be getting to work too, rather than blaming us for their problems." Under growing pressure from the EU, the Bulgarian authorities have sprung into action. There is a new agency to crack down on organised crime and new ministers have been appointed to ensure EU money does not fall into the wrong hands. Along with its neighbour Romania, Bulgaria is subject to special monitoring because neither country was deemed to fully comply with EU standards when they joined the bloc in 2007. A team of EU officials was in Sofia this week to assess progress ahead of a key report in July. While Prime Minister Sergei Stanishev admits there are problems, he denies that cutting aid is the answer. "If Bulgaria would be punished," he told me, "who would suffer? Bulgarians have always been very pro-European and they would expect indeed that they would not be deprived of the possibility to enjoy the membership of the EU, to benefit from it." The EU has already frozen hundreds of millions in aid for Bulgaria's battered roads and other desperately needed development projects. But there are billions more to come in the next years. And as one EU official who visited Bulgaria this week told me, cutting aid is clearly an option.